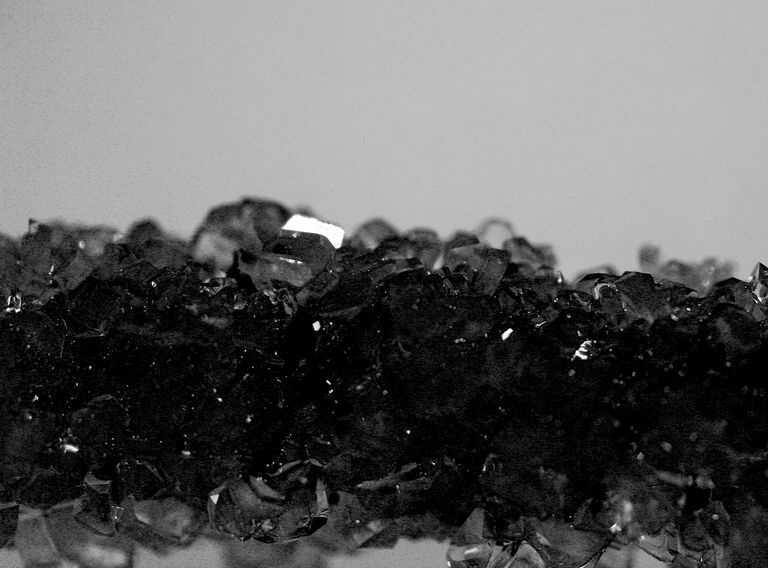 This crystal growing recipe produces black crystals. You can make them solid black like black diamonds, or translucent black like smoky quartz. Black food coloring is used to make black crystals. While this crystal recipe calls for borax, you could grow black sugar crystals or rock candy, if you prefer. The black pipecleaner is not essential, but it provides a good surface for crystal growth and is not visible underneath the dark crystals. Bend the black pipecleaner into any shape you like, as long as it will fit inside the glass or jar you are using to grow the crystals. Bend an end of the pipecleaner over a pencil or butter knife so that the shape will be hanging inside the jar. Try to keep the pipecleaner shape from touching the sides or bottom of the container. Remove the shape and set it aside. Prepare the crystal growing solution. Fill the jar with boiling water. Stir borax into the water a little at a time until it stops dissolving. You will need about 3 tablespoons of borax for each cup of water. It is fine if a small amount of undissolved borax remains on the bottom of the container. Stir in 5 to 10 drops of black food coloring. A smaller number of drops will produce translucent black crystals. If you use a lot of black food coloring, you can get solid black crystals. Place the pipecleaner shape in the jar. Allow the crystals to grow several hours or overnight. Try to avoid disturbing the crystals. You won't be able to see into the jar to see how they are doing. Wait several hours before checking on their progress. When you are satisfied with the crystals, remove them and hang them or set them on a paper towel to dry. The black food coloring can stain your hands, clothing, and furniture.